This is a course from the Barcelona World Race Ocean Campus. You can also follow this course in Spanish and Catalan. Ocean sailing puts sailors through the toughest physical, mental and environmental conditions, and that can take its toll on their health. In a round the world regatta such as the Barcelona World Race, which lasts for three months, the sailors race for weeks on end in some of the planet's most inhospitable and remote waters. That's why it's important for them to have a high level of hygiene and medical knowledge to help them to survive and overcome any illnesses, injuries or physiological disturbances they may experience out on the ocean. With that in mind, the sailors have a remote medical care service available to them, set up by the regatta organisers and based on the latest telecommunications technologies. During this course, you will learn about the basic medical techniques for the prevention of medical problems on board a yacht, how to plan medical prevention and active techniques to deal with some of the main issues that may arise during a two-crew round the world regatta. You will also be introduced to telemedical assistance protocols and the technology associated with it. This course is aimed at the general public and anyone with an interest in sailing or medicine. It is also aimed at those involved in the world of sailing who are interested in dealing with health issues in a straightforward and quick manner, either on board a boat or in a maritime context. It's also aimed at healthcare professionals who want to expand their knowledge of sailing and want to prepare a first aid kit with the basic materials to deal with small problems on board. The content may also be relevant and provide knowledge for trainee doctors and nurses or for those volunteering for sea or coastal rescue organisations (Red Cross, Sea Rescue or Lifeguards). The course is structured around five modules. 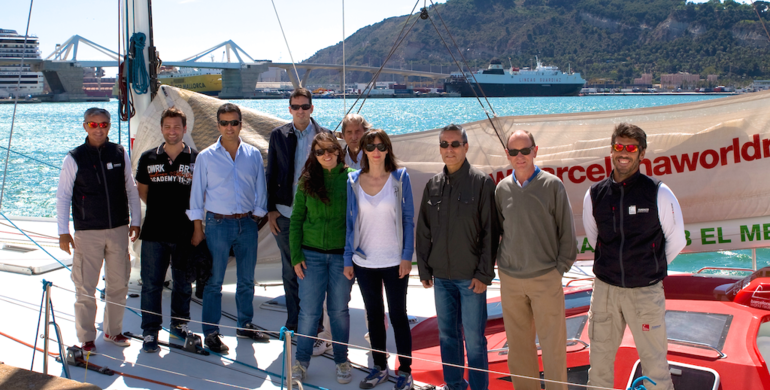 This course also has projects associated with the Barcelona World Race 2014/15: Medical assistance for the participants from the Regatta Medical Direction Team, headed up by Dr Belén Gualis at the Quirón Teknon Hospital and the development of improvements to the methodologies used in the practice of telemedicine. When students finish the course, they may, if they wish, obtain a certificate of completion from the University of Barcelona. For further information about the course and a more detailed description of the course modules, please visit the course webpage. Injury, illness and telemedicine in extreme sailing is a course from the Barcelona World Race Ocean Campus. This course has been developed in collaboration with the Quirón Teknon Hospital in Barcelona, from where Dr Belén Gualis performs her role as Barcelona World Race Medical Director. The Barcelona World Race Ocean Campus is an initiative from the Fundació Navegació Oceànica Barcelona (FNOB) and the University of Barcelona (UB). Attending physician of the Intensive Care Medicine and Coronary Unit at the Quirón Teknon Hospital and Medical Director of the Barcelona World Race 2014/15. Dr. Belén Gualis has specialist training in remote medical assistance for sporting events and advanced life support. Dr. Gualis is a Member of the Spanish Society for Intensive Care Medicine and Coronary Units and is the author of a number of a number of international papers. Dr. Gualis is the director and coordinator of the course and the instructor for Module 1: A general approach to onboard health; Module 2: Evaluating an emergency (PAR); Module 3: Symptom evaluation; and the subjects Cold-induced incidents. Hypothermia and frostbite from Module 4 and Traumatic head injuries, from Module 5.